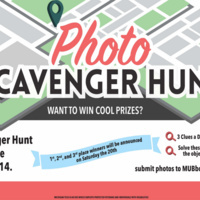 Join MUB board picture scavenger hunt happening the week of April 14. Every day 3 new riddles of varying degrees will be posted on the MUB facebook page. Solve these riddles and get a selfie with the object or location to win points. Bonus points will be awarded for coolest picture. We will announce the 1st, 2nd, and 3rd place winners at the end of the week.